The following pages intend to demonstrate the research done in Lagos by a team of volunteers under the purview of a research line of Centro de História de Aquém e de Além-Mar, and with the partnership of Associação Dinamika, Câmara Municipal de Lagos and Waterworld. 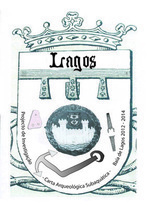 The project started in 2006, thanks to the generous support of Câmara de Lagos, whom initiated and fully funded the Projecto de Carta Arqueologica do Concelho de Lagos. PCASCL had five field missions and two field schools and resulted in the discovery or confirmation of five wrecks (Lagos A to E). The project current underway is the Carta Arqueológica - Baía de Lagos e arredores (PCASBL) and intends to produce a more academic result, including in-depth study of artifacts. In the following pages you can discover the past and present team, part of the rich history of Lagos, the field missions, the wrecks and isolated finds, our publications and our sponsors. You are also welcomed to visit CHAM's webpage, or CHAM's facebook or browse our blog where we post news of the current research. If you are interested in participating you can download our volunteering form. We will continue to update the page with lab data and more news from the field.